A week after the Democratic National Convention was held in the "Mile High City," I found myself on Frontier Airlines flying to Denver, Colorado. I was traveling to present a briefing and media training at the National Queer Asian Pacific Islander Alliance (NQAPIA) Leadership Convening. The weekend-long event was developed for leaders of LGBT Asian Pacific Islander (API) organizations to network, learn about current issues, share strategies and build their infrastructure. At the convening I found myself among more than 40 colleagues and organizational leaders from across the country. While I regularly travel to meet with these groups to provide media advocacy support and build their media relations and outreach capacity, it was an absolute pleasure to see everyone together in one place exchanging ideas and discussing future opportunities to collaborate. On Saturday, I presented a briefing to the participants on where the API community is with its media visibility. The major theme - we've come a long away, but we still have much to do to in order to amplify our voices. I also conducted a media training for about 15 new API LGBT leaders interested in developing communications plans for their organizations. Each participant received a package of our Media Essentials Toolkit, Announcing Equality report and palmcards about our work in the community. The weekend also gave me a chance to sit down with various leaders of API LGBT organizations to hear updates on their work and how GLAAD assist them with upcoming projects. Many of the groups shared their plans for various advertising campaigns and new media projects. A few days back from the convening, I have already begun assisting some of them with their work! The convening in Denver was made possible with the help and support of both the Gill Foundation and Astraea Lesbian Action Foundation. Morris Price, a Program Officer for the Gill Foundation, was primarily responsible for making this event happen. It was great to catch up Morris, a good friend and colleague. I owe a special thanks to my friends and NQAPIA founders Glenn Magpantay, Ben De Guzman and Mala Nagarajan for pulling this historic event together. 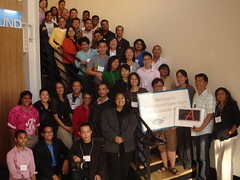 GLAAD has committed itself to being a resource for NQAPIA as it grows and develops. I am excited by their vision and plans to continue bringing the API LGBT community together.